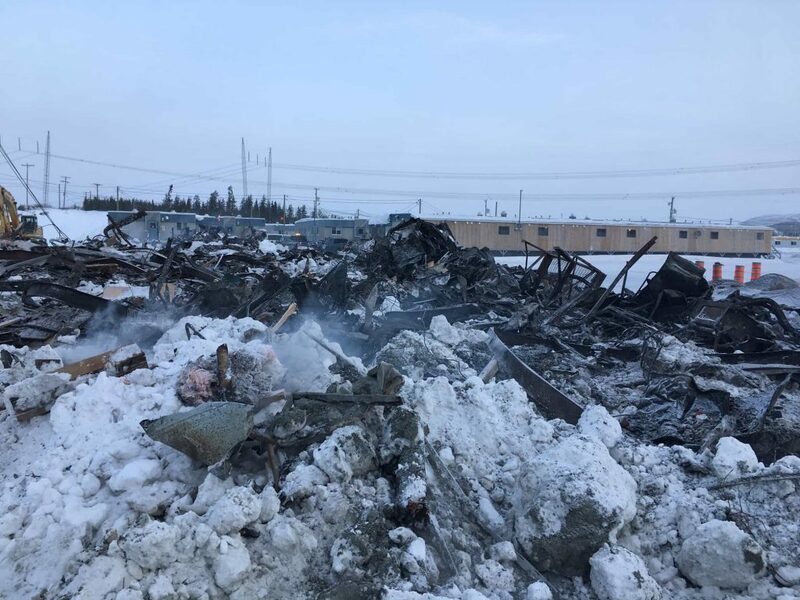 The cafeteria at the Nemiscau work camp, 18 kilometres from the Cree community of Nemaska, burned down on the night of January 30. No injuries were reported, but damages are estimated at over $1 million. In addition to the cafeteria, the Nemiscau camp has a convenience store, a gas station, conference rooms, and lodgings. The camp principally houses workers for Nemaska Lithium’s Whabouchi mine project, located 15 kilometres away, as well as workers for Hydro-Québec and the Quebec government’s Société de développement de la Baie-James. Local Tommy Neeposh was among the first people to arrive at the fire. Neeposh called the Nemaska Public Safety & Fire Department, whose trucks arrived shortly after. Loaders and other heavy machines pushed snow onto the flames while workers evacuated the trailers. Hamid Eddahir, the project manager for Gestion ADC, which handles the cafeteria’s operations, was also immediately alerted of the situation, and arrived soon after. The Nemiscau camp is a property of the Cree Construction and Development Corporation (CCDC), while Gestion ADC operates the cafeteria. Both companies are Creeco subsidiaries. “According to the procedure, when we have a fire in one place in the camp, the first thing is to be sure that no one is still in their room,” Eddahir told the Nation. Despite the fire being contained to the cafeteria, Eddahir said, it was necessary to evacuate the entire camp in order to ensure the safety of those housed at the camp. In total, 167 people were evacuated. “All the workers who were sleeping nearby the cafeteria have been rapidly evacuated and nobody was injured,” Nemaska Lithium spokesperson Fanny-Ève Tapp said in a press release January 31. “We are actively working to find a solution to offer our workers a cafeteria service and to resume our activities as quickly as possible,” she added. The fire burned almost all night, only being extinguished the following morning. Construction activities at the Whabouchi mine project were put on hold, with plans to resume on February 5. Meanwhile, Nemaska Lithium has located an alternate cafeteria facility that will be opened to accommodate their employees until mid-March, when the Whabouchi site work camp currently under construction will be opened. “We are very grateful for the rapid action of our local partners, who will be lending us the cafeteria of their nearby facility. Thanks to their responsiveness, we will be able to quickly get back to constructing the mine with minimal to no delays,” said Guy Bourassa, President and CEO of Nemaska Lithium, in a message to stakeholders. “While we are relieved that this unfortunate incident was settled promptly, we are very touched by the impact of the fire on the Cree community of Nemaska,” Bourassa added. Eddahir says that the CCDC plans to rebuild the cafeteria on the same site, and are currently seeking bids from sub-contractors to begin work on the project.